The 1854-D was the only Indian Head Three Dollar Gold Coin from the Dahlonega Mint. The primary objective of the Mint Act of Feb 21, 1853 was to authorize the use of lighter weight silver coinage. An additional clause was tacked onto the law to sanction production of the Three Dollar gold coin. Congress believed the Three Dollar gold coin would be helpful in purchasing sheets of 3 cent stamps, but that idea never caught on with the public, resulting in languished popularity of the oddball denomination. The first Three Dollar gold coins were issued in 1854. The design featured the portrait of an Indian princess with plumed headdress. The reverse bears an agricultural theme. Only 1,120 were coined at the Dahlonega Mint in 1854, which proved to be the only year of Three Dollar gold production at Dahlonega. Of that number, about 150 remain today. Other than the 1870-S (known mintage: 1), the 1854-D Indian Head Three Dollar gold coin is the most important key date in the series, and is priced accordingly. The 1854-D Indian Head Three Dollar gold coin has a mystifying record of stagnant value increases. The blue line above charts the percent value increase in retail price of the 1854-D since Year 2000. One would not expect such sluggish performance from a rare Dahlonega Mint gold coin, the only three dollar piece produced at that long ago branch mint. The red line graphs the percent increase over the same time period of our Rare Coin Values Index, which is intended to represent the overall US rare coin market. The Index is made up of 87 regular issue US coins from half cent to double eagles. 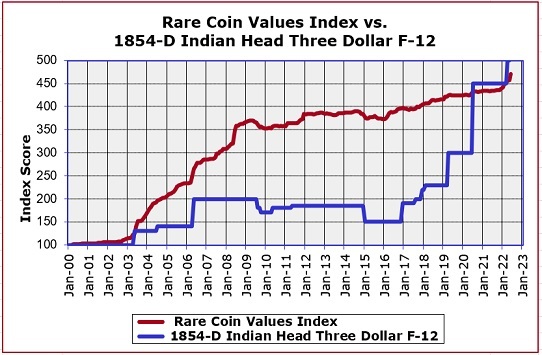 The 1854-D Indian Head Three Dollar gold coin is one of the 87 Index coins. All Index charts are updated monthly.